The natural foods grocer's quarterly earnings and full-year outlook share some of the blame for its August swoon. 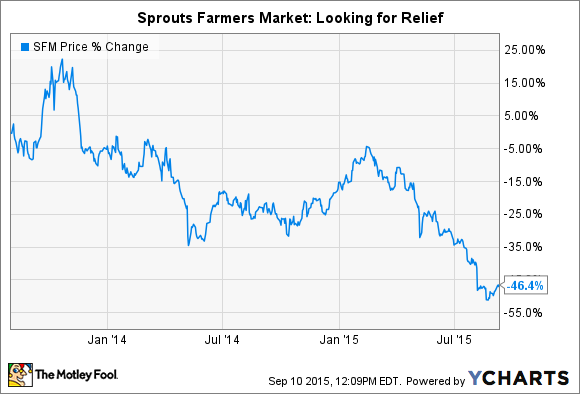 What: Shares of Sprouts Farmers Market (NASDAQ:SFM) fell 16.7% in August, according to data from S&P Capital I.Q.. So what: Sprouts lost nearly 12% on August 7 in the wake of its second-quarter 2015 earnings report, released the prior day. In the second quarter, revenue expanded 21% from the prior-year quarter to $902.2 million. In addition, net income increased nearly 4% to $31.3 million and comparable-store sales rose 5.1%. Numbers like these would pass muster in many corners of the grocery industry. But Sprouts and fellow natural foods grocers are playing defense as gargantuan retailers like Wal-Mart rapidly increase their organic and specialty offerings. The gradual encroachment of deep-pocketed, conventional grocers into what was once a niche market has caused investors to second-guess the growth rate potential, as well as earnings multiples, of companies like Sprouts. This latest bout of selling can be traced to investors' discomfort with warning signs that accompanied the second-quarter report. First, Sprouts' management indicated that for at least the rest of the year, comparable sales would be challenged by the cannibalization of existing stores by newer stores in established markets. Also, management conveyed during its earnings call with analysts that Sprouts is witnessing a deflationary environment, especially in produce. This will also pressure comparable sales. Now what: With the release of the second-quarter earnings, Sprouts' executive team trimmed full year expectations on a number of fronts. Comparable-store sales have been revised down a full 1.5 percentage points, to a band of between 4%-5%. The range of expected sales growth has been cut by 1 percentage point, to 19%-21%. Most significantly, net income is now projected to grow 13%-15% over the prior year, versus a previous estimate of 18%-22%. Shareholders may remain tentative until the deflation in Sprout's supply chain has stabilized, as this wasn't as significant an issue with competitors who reported in August. Moreover, once conditions are reversed, an inflationary environment (when prices are rising) should favor the grocer's ability to increase revenue. Sprouts has the fuel to grow more quickly than the grocery industry, chiefly through its fast store-opening pace, which is currently set at a target of 14% annual unit growth. But deflation and the effects of cannibalization as the company reinforces market share in key geographical regions may keep a damper on the SFM ticker in the near term. Stay tuned for management's update next quarter.